After a lengthy construction season in Windsor’s Little Italy, Erie Street is open to traffic — pedestrian, bicycle and vehicle — and a new roundabout at Parent and Erie is presenting a learning experience for drivers. 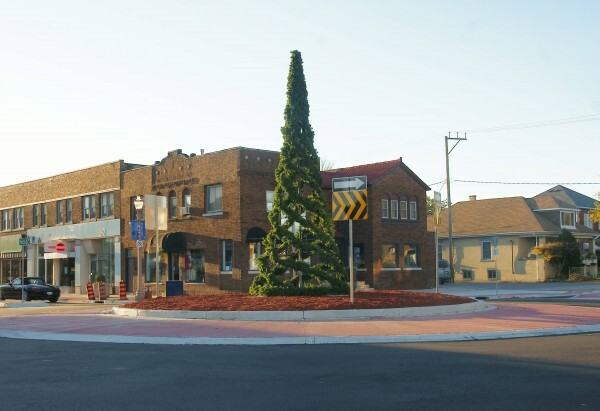 Erie Street’s $2.4 million dollar new look features wide sidewalks to accommodate extended patios, a fully-repaved road, and for the upcoming Christmas Holiday season, a large tree has been put in place in the middle of the new roundabout. The La Bella Strada project is a LEED Certified, outdoor, cafe-oriented setting styled with “old country” elements, reduced on-street parking and by next summer will feature an incredibly ‘greened’ stretch of roadway with hundreds of additional trees and flower planters. Phase One of the project involved mainly road redesign between Howard and Hall.